During the Early Devonian, the microcontinent of Avalonia collided with the northeastern part of the Laurentia (by now part of the Euramerican continent). This collision produced the Acadian Mountains, which rose in present-day New England and the Canadian Maritime Provinces. This was a large mountain belt with topography perhaps like the present-day Rocky Mountains of western Canada. The eroded roots of the Appalachian Mountains still extend from the southeastern United States to Newfoundland, and form the highland areas of Atlantic Canada. On the opposite side of Euramerica, collisional tectonics took place at the western margins of the Russian Platform, and orogeny took in the Urals and Scythian region. The East-European Platform suffered uplift and inversion tectonics; transtensional basins originated inside the Pechora basin. Study of Devonian brachiopod distribution by A. J. Boucat during the 1960s first revealed the existence of three major faunal provinces: (1) Old World province; (2) Appalachian province; and (3) Malvinokaffric province. Distribution of gastropods and other marine invertebrates confirm these conclusions. The Old World and Appalachian provinces were already in existence at the beginning of the Devonian, although their endemism (the degree to which the biota of that region are unique and found nowhere else) was not very pronounced. It increased as the Devonian wore on, reaching a peak during the later Early Devonian and Middle Devonian time. The Malvinokaffric province is characterized by a restricted fauna in which some important groups of brachiopods, such as Atrypida and Gypidalids, are absent. Typical Malvinokaffic genera are Australospirifer, Scaphiocoelia, Pleurothyrella (with unbranched ribs), Notiochonetes, Tanerhynchia, and Australocoelia. These are accompanied by a number of typical Appalachian forms such as Protoleptostrophia and Plicoplasia. The bulk of the Malvinokaffric brachiopod fauna would seem to owe its origin to Appalachian province forms [ref. Johnson and Boucot]. The alluvial environments of the Early Devonian of Euramerica were inhabited by many species of jawless fishes (e.g. Cephalaspis and Pteraspis) and eurypterids. Placoderm and osteichthyan (bony) fishes are rare in these environments: all, however. may have had recourse to the sea during their life-cycles. The thelodonts especially seem to have been geographically widespread at all stages of their existence. The variety and abundance of marginal marine, estuarine, brackish and freshwater animal life continued to increase throughout the Early Devonian period. Most representative were the diverse types of jawless fish, shown above, including many bizarre armoured forms. Invertebrates included lingulid brachiopods, bivalves, ostracods, eurypterids, limulids, scorpions, and trilobites. Vertebrates included a diverse selection of jawless fish (especially the armoured ostracoderms, see above illustration), which are at their height, and rare acanthodians, arthrodiran placoderms, sharks, and lobe-finned fish. The sort of vertebrates that prospered in these marginal marine environments were quite geographically limited. Apart from the thelodonts, they were unable to swim out into the open ocean (perhaps weighed down by their heavy armour), and moreover especially in the case of the jawless fish they could only feed on small organic particles washed down by streams, or on tiny organisms that lived in the mud near shore. Because the early Devonian world was divided into a number of separate island continents, the ostracoderms and placoderms evolved in complete isolation for tens of millions of years, so that completely distinct types of vertebrates inhabited each continent. There is no real counterpart to this in the post-Devonian world. It is as if there only birds in Africa, mammals in Europe, fish in Asia, amphibians in North America, reptiles in South America, etc. (A less extreme but similar situation occurred during the early Tertiary, with different mammalian groups evolving in isolation). Streams and freshwater environments were not as well inhabited. However, branchiopods, crustaceans (clam shrimps, fairly shrimps and their relatives), ostracods, limulids, eurypterids were probably present, along with various fish types. Plants: Terrestrial vascular plants are still generally small and restricted to the water's edge during the Early Devonian. These forms include the rhyniophytes, zosterophyllophytes, Drepanophycalean lycopsids, and (at the end of early Devonian) Trimerophytes, all of which were true vascular plants with conducting vascular tissue, stomata, and a cuticle to protect against drying. But they were still small forms, lacking proper roots and woody tissue, and hence were unable to grow beyond the height of small bushes. 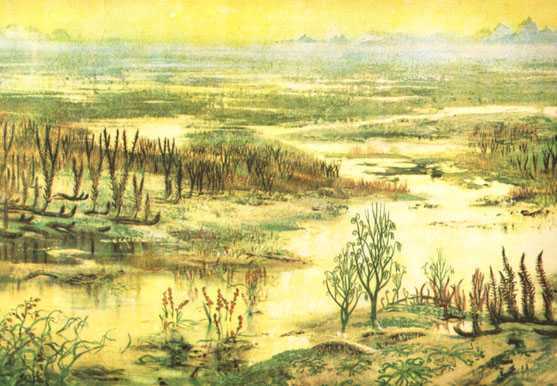 Reproducing by spores, they were confined, like the Silurian Cooksonia, to moist, lowland habitats. Aschelminthes: although such tiny organisms rarely or never leave fossils, it is quite certain that various primitive microscopic organisms as Nematodes and Rotifers had also established themselves on land. Arthropods: By the Early Devonian the terrestrial invertebrates (arthropods), were well established. The emerging terrestrial plants provided comfortable micro-habitats, food and shelter, for a variety of invertebrates, including fully terrestrial arthropleurids, arachnids trigonotarbids, spiders, and mites), myriapods (predatory centipedes and herbivorous millipedes), and flightless insects. Several semi-aquatic groups, such as the xiphosurans horseshoe-crabs), eurypterids, and scorpions, also would venture onto land.